In 2004 and again in 2008-09, Haynes toured with The Dead, featuring original Grateful Dead members Mickey Hart, Phil Lesh, Bob Weir, and Bill Kreutzmann (front row and back center) and newcomers Jeff Chimenti (back row right) and Jimmy Herring (not shown). Haynes and late Allman Brothers bassist Allen Woody started Gov’t Mule in 1994. Today's members include (from left) Matt Abts, Danny Louis, Haynes, and Jorgen Carlsson. Tedeschi Trucks Band, featuring Derek Trucks (left) and wife Susan Tedeschi (right) joined Haynes on stage during the 2015 Christmas Jam. It’s minutes before 1 a.m. on a Sunday night in mid-December 2015. Wielding his signature Gibson sunburst guitar onstage at Asheville’s U.S. Cellular Center, Warren Haynes is sharing the spotlight with The Doobie Brothers. And while the 27th annual Warren Haynes Christmas Jam is far past its halfway point, it’s nowhere near winding down. The benefit concert—where Haynes brings together his famous friends and associates, including the likes of Jackson Browne, Sheryl Crow, Peter Frampton, Bruce Hornsby, John Paul Jones, and scores more—is only the most high-profile example of Haynes’ deep local ties. A titan of Southern rock who won a Grammy for Lifetime Achievement in 2011, Haynes is widely known for his virtuoso guitar licks and bluesy vocals. At the Christmas Jam, there’s a fleeting moment between songs: In front of thousands of enthusiastic fans, Haynes leans in to share quick off-mic words and a warm grin with Doobies’ guitarist Patrick Simmons. That smile conveys the sense that at this moment, on this stage in his hometown, there is nothing else in the world Haynes would want to be doing, nowhere else he’d rather be. Shortly before the big night, Haynes sat down with WNC magazine, taking a break from signing a stack of limited-edition concert posters, the profits of which (like those of the Jam itself) would go to Haynes’ favorite charity, Habitat for Humanity. Over the course of the conversation, he reached deep into his considerable inventory of rock ‘n’ roll memories. With a career spanning almost four decades, there’s plenty to look back on—but looking forward, it’s clear that Haynes is essentially still a guitar-playing North Asheville kid who jumps at every chance to make music. He also frequented Caesar’s Parlor, a saloon on the northeast corner of Merrimon and Edgewood Road. In those days, the legal drinking age was 18. But, Haynes laughs, “a few of us would get away with sneaking in to watch music” during younger years. “And once I discovered that was a possibility, I did it all the time.” He heard and became friends with local musicians including Ray Sisk, Malcolm Holcombe, and Larry Rhodes. “They took me under their wings and helped me learn more about songwriting,” Haynes says, and eventually he was invited onstage to play a borrowed guitar. “For a 14-year-old kid, it was a big thrill,” he says. For those paying attention, it was clear Haynes was destined for bigger things. “I knew early on, not long after he started playing the guitar, that Warren was going to be very good. He never put it down,” Haynes’ brother Brian says. “I was always confident that he had what it took.” By the late 1970s, Haynes had a Southern rock band, Ricochet, and word started to spread about the young Asheville guitarist. From that point forward, Haynes’ musical prowess became even more widely known. He was recruited to play guitar in Dickey Betts’ group (Betts’ regular band, The Allman Brothers Band, was inactive in those years). When the ABB reunited in 1989, they brought Haynes aboard. The group made a point of not pressuring Haynes to sound like original guitarist Duane Allman. “Their attitude was, ‘We hired you to play like you,’” he recalls. 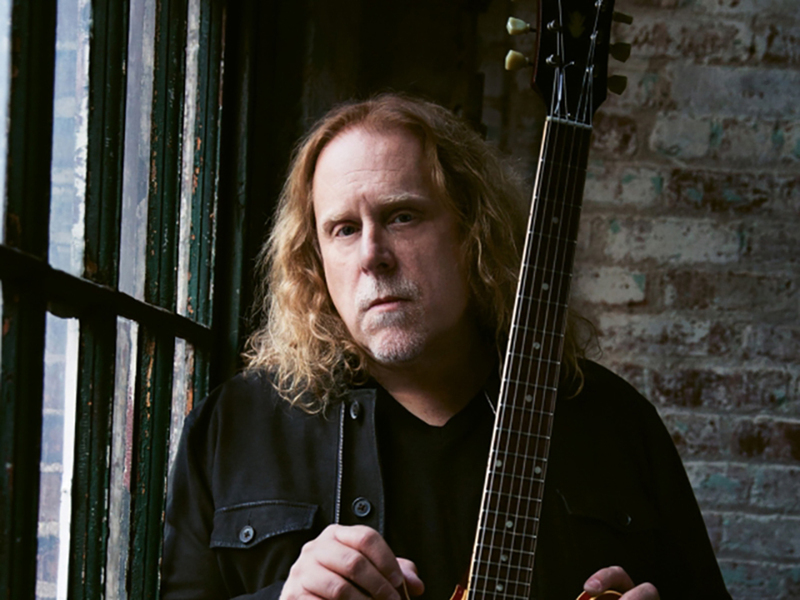 Haynes launched his own band, Gov’t Mule, in 1994, dividing his time between that group, The Allman Brothers, and his many other musical collaborations, including stints touring with The Dead (featuring original members of the Grateful Dead) in the mid 2000s. The Allman Brothers Band played its final show in 2014, but true to form, Haynes kept on rocking. His third solo album—the rootsy, Americana-flavored Ashes & Dust—was released in 2015 to wide acclaim. Though Haynes’ musical path often takes him far from home, in many ways, he’s never really left. Even in his earliest days as a touring musician, he’d return home to be with friends and family for the holidays. And late in those evenings, Haynes would often head out to some of his favorite old haunts (including the now long-gone bar 45 Cherry) and jam with fellow local musicians. Nobody would have imagined it at the time, but those informal get-togethers evolved into the region’s most popular annual all-star concert. After a few years at 45 Cherry, the concert was moved to a popular downtown club, Be Here Now. Gov’t Mule bassist Allen Woody was among the regular participants. “He would get in his little yellow pickup truck and drive from Nashville every year,” Haynes recalls with a smile. If offered a per diem, “Allen would just wave his hand and say, ‘Aww, just put it toward the charity.’ He did that year after year.” Tragically, Woody died in August of 2000 of a reported drug overdose, just days before he and Haynes were to launch an extensive tour with Gov’t Mule. Distraught at the loss of his friend and bandmate, Haynes soldiered on, and the Jam continued to grow in size and scope. In 1999, it had moved to the 2,400-seat Thomas Wolfe Auditorium, and in 2001 it expanded into the Civic Center arena—today the 7,200-capacity U.S. Cellular Center. Tickets for the concert gala routinely sell out months in advance, as more and more big names are added to the shows. Recent participants have included Jason Isbell, Widespread Panic, Keb’ Mo’, The Avett Brothers, Los Lobos, Ani DiFranco, Bernie Worrell, and dozens more high-profile acts. It’s a massive undertaking, but Haynes’ commitment—coupled with the event’s enduring popularity—is enough to sustain the Jam. Making the music he wants to make has taken Haynes to stages and studios across the nation and around the world. But with his local roots and stewardship of the Christmas Jam, it’s certain that however far he roams from WNC, he’ll always return home.